These are the materials used by many successfully scrubbed tanks, and is the unoffical standard build method. In no way is this gospel, however if you are building your first scrubber you should start with this standard build. This will be a very inexpensive build and will cost most people ~$15 - $25 dollars. Although, most keepers have a lot of these materials just laying around. After you make your first scrubber and you feel you can make adjustments to the design to achieve better results, please always post pictures of weekly growth, harvest measurements, water chemistry and materials used as well as how you designed your system. 2 sq. inches of screen per gallon, if lit on just ONE side. -18 hours lights ON, 6 hours lights OFF, per day. 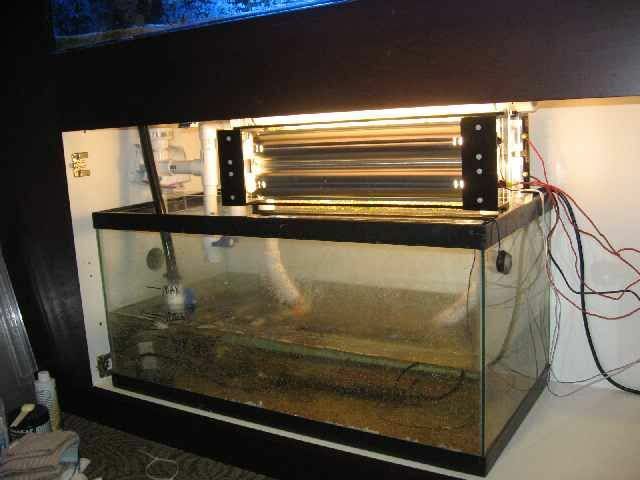 People have used bucket systems as well as systems directly feed into the top of the display tank. As these designs are not asteadicly pleasing and google can be your friend for design plans for these setups. However other than plumbing, and placement they have little differences. Many thanks to the work done by SantaMonica, most of this collection of data has been gathered form his great work. Last edited by DgenR8; 05/15/2011 at 07:32 AM. Here are pictures of my setup, its a single pump system. 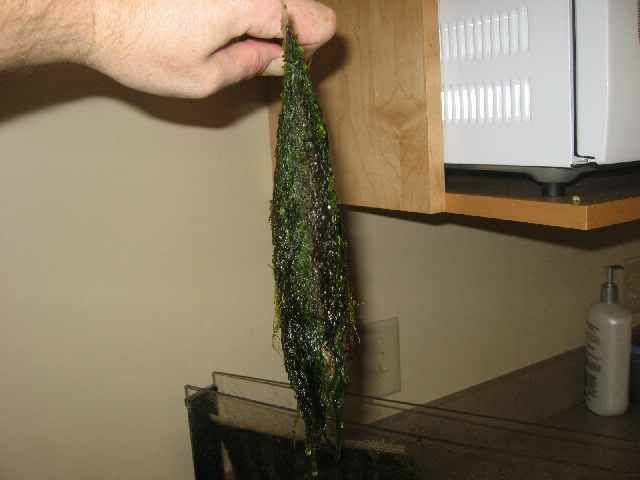 Uses four 23w CFL bulbs and I commonly harvest 1 cup of algae. This was my harvest from a few weeks back. This Sunday I will post my current harvest results. This is a full tank shot for reference, its 6 months old and never has had any algae issues. Here are my last testing results. 1. 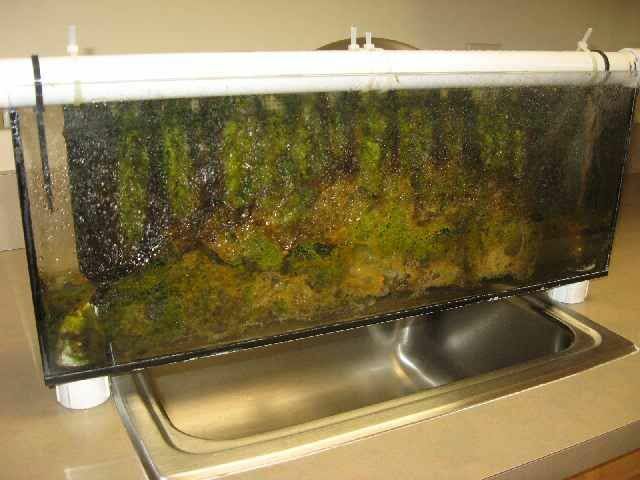 Why is the area underneath your scrubber so filthy? The pump area and tank are free of algae, but the scrubber area looks like a cess pool. 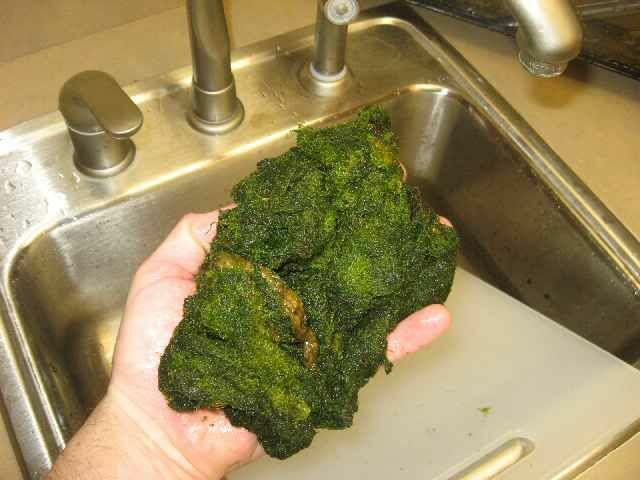 Is this from algae breaking off? Is this normal? 2. You write-up was awesome, but I think your price is a little misleading. I started my ATS 2 days ago. By the time I bought 2 26 W CFLs, 2 reflectors, a timer, PVC fittings, PVC pipe, tubing, screen, and a MaxiJet 1200, my total was between $75-80. 3. You might want to be more specific about the "canvas". I got mine at Hobby Lobby. It came in different sizes. I bought a 10.5"x13.5" piece for $0.49. Again, I applaud your contributions to the forum. Please dont take my comments as a slam! Pump non-stop, light 18 hrs on, 6 off. That algae grows from the extra light into the sump, I have never once cleaned the sump of the tank, I feel that it (the algae) helps breed pods, mysis and other critters, they live well and undisturbed. Price can very, I got my lights for $6 dollars each, your screen price is accurate, and PVC is cheap, I got a 10 footer for my tank for $10 at homedepot. Still using it up from when I pumped the tank... I should add that I added two additional drop lights a couple of weeks back for some each growth, one on each side. Its plastic canvas that can be purchased at most hobby stores, like Joanne's and Michael's. I its used for knitting, it looks like a plastic mesh screen. Reads right, lets see some pictures of the setup as well as a whole tank shot for reference later on... thanks!! Welcome to the wonderful world of ATS! Last edited by srusso; 02/15/2011 at 08:49 PM. Here is some great videos to watch on algae scrubbers, Inland aquatics use a dump bucket type system, and it was the first type built in the 70's. Although this design made building and ATS easy and cheap for hobby use. 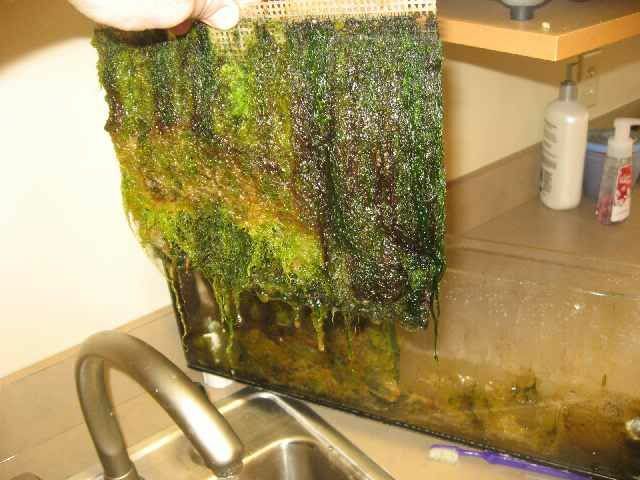 This is proof that algae scrubbers can be used on small and large scale systems. 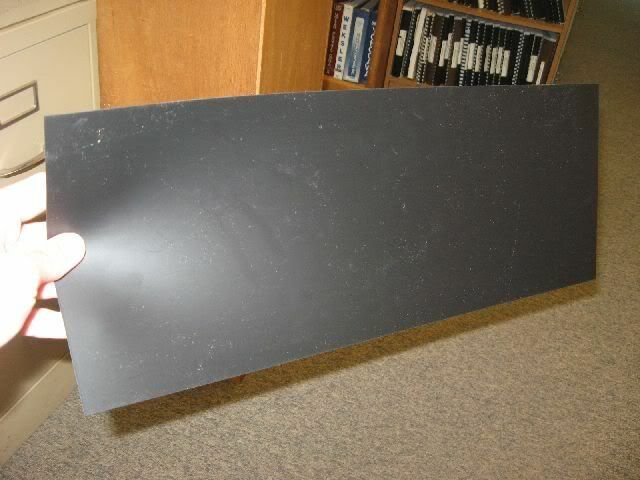 for a 40B, the size of the plastic canvas would be 5''x8'', which gives an area of 40 inch²? EDIT: BTW, if you got the ATS, do you still need CUC in your DT? i already have all the materials needed for my ATS, i just didnt assemble it yet cause i want to try a refugia with chaeto. Last edited by rysher; 02/15/2011 at 10:00 PM. Yes, a 5x8 inch screen will work for a 40 gallon as long as you have lights in both sides of the screen. Yes, a clean up crew is still needed. If you doing a design like mine, you can setup a refuge under your ATS screen, however some people report that their algae scrubber out competes chaeto easily and it dies out in most tanks. Thanks for the info. This may be a stupid question but for those of us with all in one tanks and no sump to speak of (just a cramped back chamber) is there a way to implement an alternative ATS design. Some others have managed to modify small bio cubes to include a small screen and light. People have taken pictures I will post them as soon as I can. Any thoughts on the 3D ones people have talked about? 3D scrubbers have huge potential, however in terms of basic scrubbers they are a bit more advanced than most first timers should attempt to build. They require an acrylic enclosure. Very nice write up and graphics. One small nitpicky thing: a 10"x10" screen lit by both sides actually has 200 square inches of surface area (both sides). This is my ATS build, based on about 4 months of research and design, and it is the 2nd generation that I'm running on the tank. 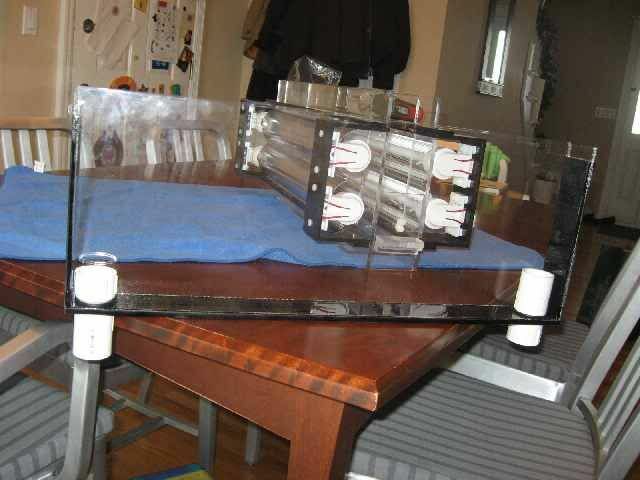 It is built out of 1/4" acrylic and is 2 parts, a frame and an enclosed screen box. The outer frame spans the sump, supports the inner box, provides mounting suppport for the lights, and shields the sump from excess light (although not perfectly). 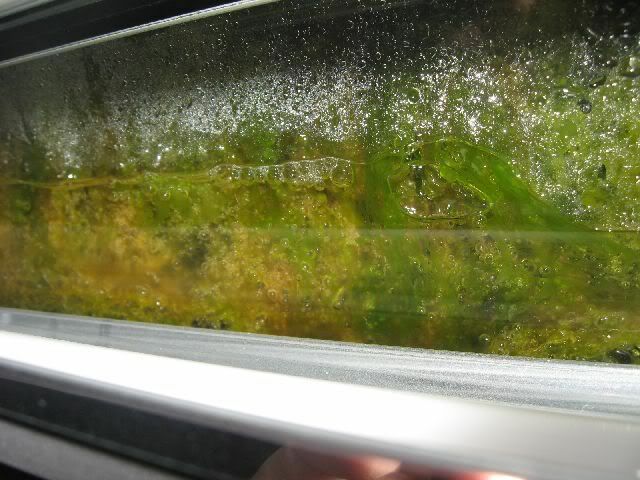 The inner box that encloses the ATS screen, which protects the lamps from spray and allows the box to fill up with water as the algae grows, promoting 3-D growth. 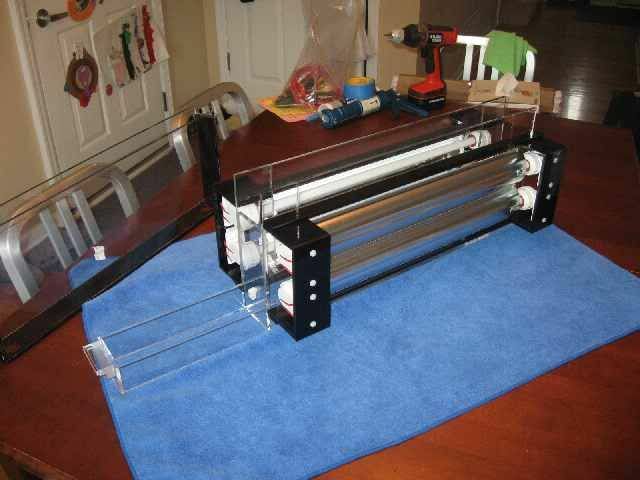 Acrylic manufacturing: if you know what you're doing, it only take a few hours from first cut to last joint weld. To have someone make one for you could run several hundred $. 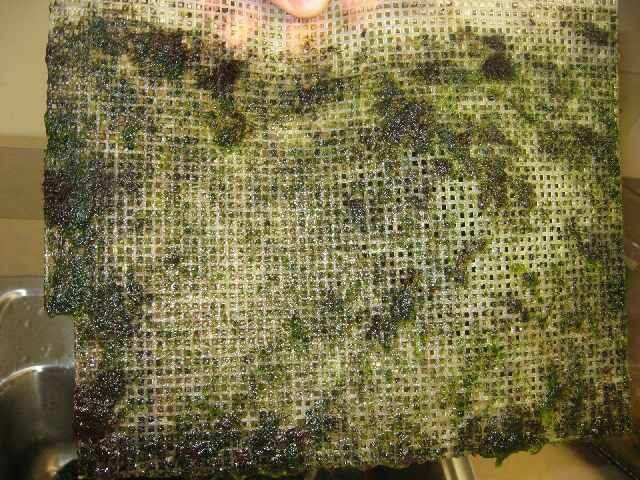 As the algae grows on the screen, it expands out enough that it makes contact with the walls of the box. This causes it to trap a little extra water, which starts a cycle of addtional algae growth that has been termed "3D" growth. 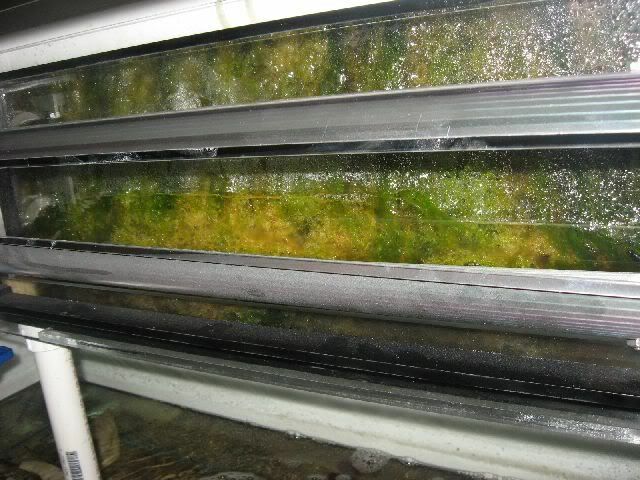 In reality, all algae screens do this, but the advantage to the flooded box is that as the algae gets suspended in the water column, more light reaches the algae beneath it (closer to the screen) and so you get deeper growth. Supposedly, you can let a screen grow longer than 7 days between cleaning with a design like this, but I'm not risking it anytime soon, since this isn't my personal tank. I've never bothered to drain & weight it or put it in a measuring cup. I should probably do that. It looks like at least 3 cups/week and probably at least 16 ounces. Flow rate is 433 GPH, so screen flow rate is only 22 GPH/inch, which is horrendously low. Working on fixing this. Green Digitata, 2 about 6" and several others from 1-3"
This thread has been stuck. This is incorrect, a screen lit on both sides that is 10x10 has a 100 gallon scrubber capacity. THANK YOU! 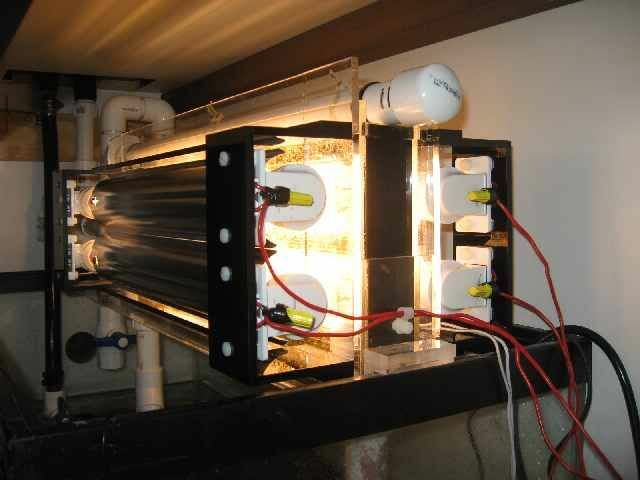 This is huge for the algae scrubber community!! Ok. I have been following all of these threads lately and it does spark my interest. Honestly I don't care how I get the water clean: ATS and carbon bag vs. skimmer and bag, I just want it to work. I think along the lines of tools in a work bench. All can be used for the right job at the right time. Also I want to look at my tank not care for it if that makes sense. I am setting up a 37 gallon FOWLR DT and a 20 gallon high sump. 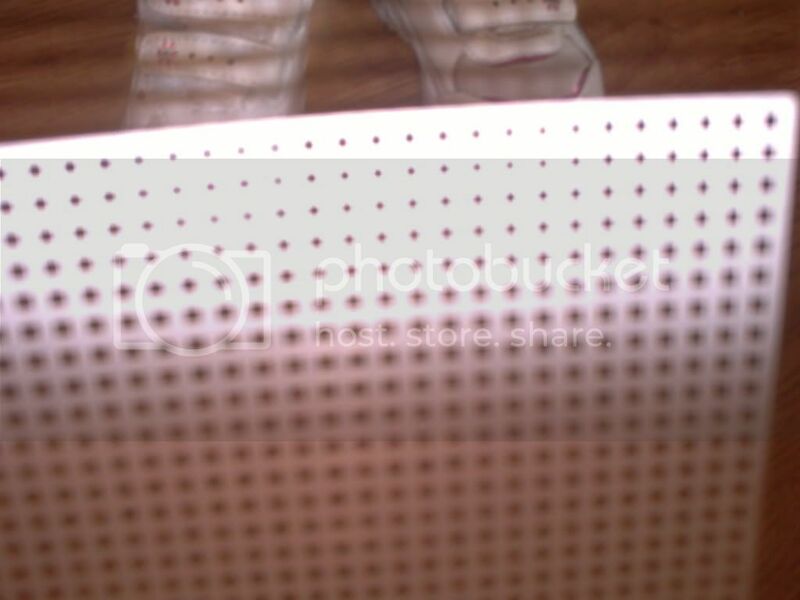 screen: 50 sq. in. double side lit or 100 sq. in. single side (would have to add more lights correct?). not sure since I am in the sump design phase right now. flow: will probably T off my overflow pipe and adjust with a valve or could do a second pump like above though gravity = no cost. Has anyone split a ATS into two parts single sided so that there is at least one part lit 24/7 like cheato. 4 pm on 8 am off for the second. Floyd R Turbo, thank you for your wonderful write up!! Great example of a 3D scrubber. Wonderful pictures and videos!! Flow across screen should be minimum 35 GPH/inch of screen width. of course, you can get away with less, just look at mine at 22 GPH/in, but it's also T5HO and enclosed. Slot tube should NOT have crosscuts. Slot should be 1/8" wide. 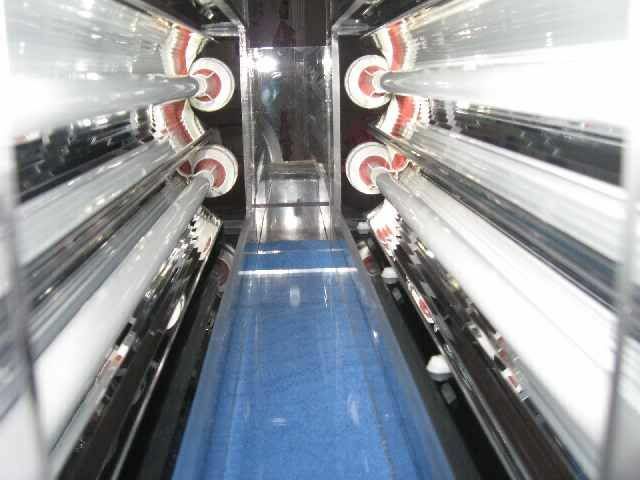 Use spray and light blockers if not enclosed in acrylic box so that your lights are protected. Originally, crosscuts were recommended to prevent slot clogging. Eventually it was determined that it makes the flow uneven and actually promotes algae growth into the slot. With no crosscuts, the head pressure on the slot prevents algae from growing into the slot, but may cause sideways spray. Hence spray / light blocker. Lights must - MUST - be in close proximity, and must pointed directly at screen, perpendicular if possible. The vast majority of ATS issues are related to incorrect placement of lighting. After screen is broken in (5 to 6 weeks), you MUST clean every 7 days no matter what. During screen break-in period, cleaning may need to be more frequent depending on nutrient load and type of algae growth. You can see that the GHA cleans off easily with the backs of your fingernails. The dark spots are the red turf. You need a razor blade to clean that stuff off. Old dump-bucket style scrubbers used this stuff and whoa does it stink bad when it's exposed to the air and your nostrils. 1) Plan it out and do your research. Building a scrubber without thinking about it could put you into the category of "I tried that and it didn't work" because you failed to plan. Don't be that guy. We want you to not be that guy. Or gal. We want you to succeed. 2) Test your overflow rate. This is critical and I cannot overstate the importance. TEST YOUR OVERFLOW RATE. Take a pitcher and record the time it takes to fill it from the overflow inlet into your sump. Do this a dozen or so times and figure out your actual GPH. Don't use your pump rating or even pump rating less head, do it with real conditions. You might be surprised. Design the WIDTH of your screen accordingly, Flow rate / 35 = inches of screen width. Then, tank volume / width = length of screen. 3) Present your design to someone who has built one and see if they catch a potential issue. It's easier to go back to the drawing board than it is to deal with a poor design after it's already running. 4) Look at as many examples as you can and learn from what others have done. There's a huge thread on Reef Sanctuary with hundreds of builds (ignore the hotheads) and of course there's SM's site. Not a stupid question at all. The original dump-style scrubbers were top-of-tank. For nano scrubbers, SM did design one using a specific type of CFL lamp. 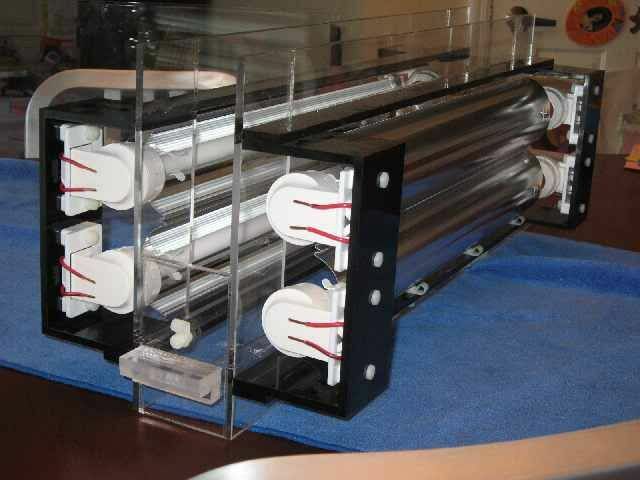 You can also implement a top-of-tank acrylic box scrubber that would be about 24" long, 6" tall, and 6" wide with lights. You would run the pump directly from the tank into the screen tube, and the output would just dump out into the top of the tank. This design is actually the preferred method if you want to acheive massive Pod growth, since the pods live on the screen and would get washed into the tank without having to go through the pump. The downside is the ATS competes for space needed by DT lighting. I am in your exact shoes; I don't care what works, just as long as it gets the job done. Hence why I am doing this ATS experiment. I put the ATS on my 40 BR which houses a pair of clowns, eventually a nem, and some frags. It does have a skimmer and new ATS at the moment. My 100 gallon has an skimmer rated at 1.5x tank volume, refugium w/ deep sand bed, and chaeto. My nitrAtes are 0, PO4 is 0.07 (which was last taken an hour after feeding, and I dont rinse my food) Hanna checker was new, so I only have one reading. I have ZERO algae in my display; I have to feed the crabs and snails algae sheets. I have such little growth on the glass I only have to mag-float it every 7-10 days. I cannot complain about my tank; dumping a skimmer cup once a week is the easiest thing in the world to do. I am curious what happens on the ATS/40 BR tank. Shutting the ATS down, scrubbing algae off the screen, replacing bulbs every 3 monthas, etc seems too much work at the moment (I can be lazy ), but I am willing to try new things.